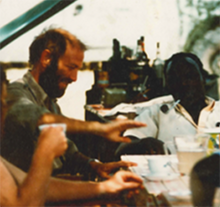 Glynn (in focus) in characteristic “explaining mode.” From left to right, Jack Harris, Kamoya Kimeu and Nzube at Kamoya’s Camp on the Karari Ridge, Koobi Fora, in the early 1970s. Glynn had called in to the UK on his way to China where he was due to join a group organized by the National Academy of Sciences, but he was not his usual chirpy self. His health rapidly deteriorated in China, and he was en-route back to the US in a military plane when he collapsed and died at the US airbase in Tokyo. Glynn was born in Cape Town, South Africa. His mother was the flowering-plant expert at Cape Town’s Bolus Herbarium, and his father was Professor of Botany at the University of Cape Town (UCT). After finishing school in South Africa Glynn worked on Bronze Age and late Mesolithic digs in England, and after successfully completing a diploma course in archeological techniques at The University of London, he returned to South Africa to study geology, zoology, and archeology/ethnography at UCT where he received a BSc in 1958. In the summer of 1956 he hitchhiked up to Zambia to study the collections at the Rhodes-Livingstone Museum, thus beginning his longstanding professional relationship with Desmond Clark. His UCT mentors were John Goodwin and Monica Wilson, and when Goodwin fell gravely ill, Glynn, just 21, was invited to take over his courses. This experience served Glynn well, for he was awarded an Elsie Ballot Scholarship to study Paleolithic Archaeology with Charles McBurney at The University of Cambridge, England. He was there from 1959 to 1961 during which he passed the Archaeology and Anthropology tripos and participated in a field survey in Libya with Eric Higgs, and excavations at Abri Pataud, France, with Hallam Movius Jr. Eager to return to Africa to pursue field research, Glynn accepted Louis Leakey‘s invitation to become the Warden of Prehistoric Sites within what was then called the Royal National Parks of Kenya. As Warden (1961–2), and subsequently as Deputy Director of the Center for Prehistory and Paleontology at the Coryndon Museum (1963–4), Glynn was responsible for the oversight of several prehistoric sites in Kenya, including Kariandusi and Hyrax Hill. Louis Leakey encouraged Glynn to visit Mary Leakey at Olduvai Gorge, and in 1964 he co-led, together with Richard Leakey, a field expedition to the western shore of Lake Natron in Tanzania. They surveyed sediments and discovered several promising archeological localities as well as a massive hominin mandible from the site of Peninj. But Glynn was soon focusing most of his scientific energies on the Acheulean site complex of Olorgesailie, where he began and developed a close intellectual partnership with his wife Barbara Miller. Their professional collaboration continued until his untimely death. The impressive concentrations of Acheulean artifacts and faunal remains at Olorgesailie became the focus of Glynn’s PhD dissertation project. In it he formulated research questions and developed methodological approaches that ranged widely, including site-formation processes, artifact function and design, and the reconstruction of early hominin hunting abilities and social organization. In an early example of taphonomic research, Glynn experimented with replicas of bones and stone tool to evaluate the sedimentary processes that may have led to the unusual concentrations of large bifaces and faunal remains at Olorgesailie, and he developed innovative multivariate approaches to analyze the attributes of hand-axes and cleavers. In 1965 Glynn returned to The University of Cambridge to analyze the results of his Olorgesailie research and he was awarded his PhD in 1968. A monograph based on this work, Olorgesailie: Archaeological Studies of a Middle Pleistocene Lake Basin, was published in 1977. Desmond Clark recruited Isaac to the faculty of the University of California at Berkeley in 1966, where he joined a group of colleagues including Sherwood Washburn, Phyllis Dolhinow, Theodore McCown, Elizabeth Colson, Richard Hay, and Garniss Curtis, all of whom had interests in Africa and in human evolution. At Berkeley, Isaac and Clark established what quickly became the preeminent program in African prehistory and the archeology of human origins. Clark Howell joined the program in 1970 and Tim White in 1977. In 1969–70 Glynn returned to Kenya to begin field research in the Late Pleistocene deposits in the Naivasha-Nakuru basin of the eastern Rift Valley, but around this time his old Natron colleague, Richard Leakey, invited him to co-direct the East Rudolf Research Project, later renamed the Koobi Fora Research Project. Although he focused on documenting and interpreting the archeological record in the region, Glynn’s field experience and training in geological and evolutionary sciences shaped his leadership of what became a collaborative and interdisciplinary investigation. Glynn focused on Kay Behrensmeyer’s discoveries of Oldowan artifacts associated with the remains of a variety of fossil animals in relatively undisturbed channel fill and deltaic deposits. Building on data recovered from excavations at sites such as KBS (FxJj1) and HAS (FxJj3), Glynn formulated and developed his food sharing/home base hypothesis, and thus began a decade of empirical investigations into the technological abilities, subsistence patterns, ranging behavior, and social strategies of early Oldowan tool makers. Much of the research was later published as Volume 5 of the Koobi Fora Research Project monograph series. The KBS and HAS sites were initially thought to be close to 2.6 Ma because of their stratigraphic relationship to the KBS Tuff, potentially making them the oldest evidence of stone tools and animal butchery. But these early dates stoked a contentious debate because they were much earlier than suggested by comparable faunal remains at the nearby Omo Shungura Formation. Ultimately, a comprehensive reanalysis of chronostratigraphy in the Turkana Basin found that the Koobi Fora sites were closer to 1.9 Ma. During this dating controversy, Glynn was a strong advocate for collegial dialogue and the importance of undertaking new research and analyses to help resolve the apparently discrepant dates. Glynn moved from Berkeley to Harvard University in 1983 but his intellectual home base remained in Africa. He prioritized African scholarship, training students and expanding international scientific collaboration. One of his last publications Ancestors for us All: Towards Broadening International Participation in Paleoanthropological Research published in 1984, focused optimistically on the ethical responsibilities and potential of integrative human origins science. Glynn’s untimely death, at the height of his powers, was not only a tragedy for his family and friends, but it has cost paleoanthropology dearly. Glynn led by example, and his personal and intellectual generosity, logical rigor and intellectual humility, have all been sorely missed. It is my firm belief that many of the unfortunate trends in our discipline we see today, most of which run counter to all Glynn stood for, would not have developed if Glynn’s career had run its course. I miss him personally and professionally as much now as I did on the day I learned of his death three decades ago. “.. if Watson and Crick had not discovered the structure of DNA, one can be virtually certain that other scientists would eventually have determined it. With art - whether painting, music, or literature - it is quite different. If Shakespeare had not written Hamlet, no other playwright would have done so”. Lewis Wolpert The Unnatural Nature of Science p. 86 1992, London: Faber. It is exactly 25 years, and thus a generation ago, since the posthumous publication of the last of Glynn Isaac's single author papers. Thus, for today's graduate students and for younger researchers the only contact they have with Glynn is his publications. Fortunately many of these have been reproduced in The Archaeology of Human Origins edited by Barbara Isaac (1989). In the Foreword to that edited volume no less an archeologist than Mary Leakey paid tribute to the way Glynn helped sweep away her "fallacious beliefs" leaving her with "a greater clarity of mind" (ibid, p. xv) and in his excellent and informative introduction John Gowlett refers to Glynn contributing "many of the most penetrating thoughts conceived within the domain of human evolution" (ibid, p. 1). To those who did not know Glynn this tribute might seem hyperbolic but in this short essay I hope to demonstrate that for those of us who had the good fortune to be his colleagues it is a realistic and even-handed assessment of Glynn's contribution to human origins research. My initial contact with Glynn came through our participation in the East Rudolf Research Project (ERRP). I had been to East Rudolf in 1968 as a medical student, before Glynn's involvement, but by the time I returned in 1971 Glynn had joined the ERRP as its co-leader and I was still a very junior participant. Many of my friends know what my critics have long suspected; I have no formal education in archeology. At the time this was both "bad news" and "good news". The bad news is obvious; I did not know a flake from a hand-axe. The good news is that it meant I needed to learn "on the job" and Glynn was a willing and generous tutor. Although there was a central permanent camp at Koobi Fora in the 1970s as far as field camps were concerned the archeologists and the paleontologists used to operate more or less independently, with Glynn in charge of the archeology camp and Kamoya Kimeu the de facto leader (between visits from Richard Leakey who was by that time running the National Museums of Kenya as well as co-leading the ERRP) of the paleontology field effort. My prowess as a fossil finder was on a par with my archeological knowledge, so on several occasions I was "released" from being an ineffective field paleontologist to go and work as a field assistant with Glynn and/or Kay Behrensmeyer. My main memory is of the "scatter between the patches" project, which was a quintessential Glynn Isaac-type question-driven endeavor. It was obvious that there were places called sites where stone-tools and other evidence of hominin activity were concentrated, but did that mean that stone-tools were confined to such places, or were they more widely distributed across the landscape, but in such low numbers and thus at such a low density that they were effectively invisible? My memory is that 5m-wide squares were randomly chosen across the landscape and these were to be crawled over to make sure we picked up each broken bone and small flake. I was used to random trials in medicine, but random squares were something else. Sometimes a random square would coincide with a thicket of thorn bushes or with a steep scree-like slope. No amount of special pleading on my part could persuade Glynn to transfer to a more convenient adjacent square, so off you went crawling under "wait-a-bit" thorns, your nose within inches of the ground. You learn a lot about someone when you share that type of experience, and if you have the good fortune to share it with Glynn Isaac you learn a lot else as well. The first thing I learned from that project was that Glynn was not just an archeologist. He was an evolutionary biologist with a special interest in the evolution of human behavior who happened to use archeological methods. Glynn used hypotheses in archeology the way biologists do. He thought in terms of testable models, but whereas biologists might be able to perturb nature with a well-designed experiment, Glynn would test the hypothesis with empirical observations. He did not merely “talk the talk” of a Popperian, he really “walked the walk”; he was his own fiercest critic. But he was not averse to experimentation and together with his students and geological colleagues he conducted several important taphonomic experiments involving recently killed or scavenged crocodiles and large mammals. The second lesson I should have learned from Glynn is intellectual humility. Despite his towering contributions to human origins research one never had the sense that any of these contributions were "his" property. He never sought recognition for them. To him they were like a contribution to a communal meal; it was no more or no less than was expected of any participant. His assessment was that his idea or hypothesis was just one among many, primus inter pares, but the rest of us knew that was not true. The third lesson concerned the manner and tone of scientific discourse. Glynn was adamant that the aim was hypothesis building and then hypothesis testing. In an ideal world you should test your own hypotheses, but in the real world it is inevitable that on occasion others will test them for you and find them wanting. Glynn refused to take such attempts personally and I have a vivid recollection during the time of the "KBS tuff controversy" that Glynn worked hard to maintain his friendships with those on the other side of the debate. Glynn did not worry about who "won" or "lost"; he was content as long as our collective ignorance was being reduced. So how does the quote from Lewis Wolpert's book relate to Glynn Isaac? In an important sense the quotation is correct. If Glynn had not excavated at Olorgesailie or at Koobi Fora, someone else would have done and perhaps they would have made as good a technical job of it as Glynn did. But in another sense the quotation fails to capture the intangible and arguably the more important contributions made to science by special human beings such as Glynn. He set a standard that made other scientists perform above their potential and his demeanor and behavior stimulated others to think in ways they would not have done without Glynn's benign but powerful influence. If all this sounds hopelessly airy-fairy then I urge you to read a paper of Glynn's that is not included in volume of his collected papers. It is a review contributed to a Nobel Symposium held in 1978, but not published until 1981 (Isaac, 1981). Entitled "Casting the net wide: a review of archaeological evidence for early hominid land-use and ecological relations" it demonstrates both the breadth of Glynn's interests and expertise and the depth of his wisdom. In it he advocated that "behaviour, adaptation, phylogeny, and taxonomy cannot be seen as matters for separate investigation" (ibid, p. 245) and he wrote of his own efforts to "try to see if the archaeological record of the development of human behaviour helps us in any way to formulate explicit, testable hypotheses that can serve as the first approximations of answers (my italics)" (ibid, p. 230). He also wrote urging scientists engaged in human evolution "to adopt less gladiatorial poses" and he went on to opine that "whereas the prizes used to go for offering or defending a single plausible version of the evolutionary story, I advocate that from now on the laurels should be awarded for providing a series of alternative models which can be tested and used to guide future research" (ibid, p. 230). It is my own belief that if Glynn had lived out his life in the way we all hope we will do (i.e., to well beyond “three score years and ten”) he would have made a real difference by influencing his colleagues to set aside the confrontational style that unfortunately still persists, and apparently prospers, today. The last lesson I learned from Glynn is the value of enthusiasm. Not the breathless enthusiasm beloved of announcers in the media, but the type of enthusiasm that never lets a research opportunity or a “teachable moment” slip by. But I also learned that Glynn’s enthusiasm could have costs as well as benefits. That learning experience took place at the “First International Congress of Human Palaeontology” held in 1982 in Nice. No one who attended that meeting will ever forget it. Not, I might add, for the science, but for the sheer scale of the hospitality. Henry de Lumley, who seemed to have had access to half the annual GDP of France, organized it. The final banquet is the stuff of legend. It was held in the gardens of the Matisse Museum at Cimiez, on the outskirts of Nice. The term “garden” is a misnomer, for it consists of olive groves within and around a Roman Amphitheatre. Fleets of buses took us there and we strolled along the pathways enjoying the generous food and the flowing wine. However, this was merely the hors d'oeuvre for at an appointed hour cloths were whipped off tables that positively groaned with roasted meat cut from carcasses on spits and even better wines. It is fair to say that my memories of that evening are vague, but I do distinctly remember both Glynn and Desmond Clark each holding a ribbon and dancing round a Maypole, and police motorcyclists with whistles trying to herd human paleontologists towards the waiting buses in the early hours of the morning. Much earlier in the day, when the early morning sun was shining brightly and Mediterranean was at its bluest, Glynn had decided to take a morning swim and he persuaded Derek Roe and me to join him; none of us had swimsuits. Those of you who know Derek will not be surprised that he declined the chance of a swim either in his undergarments, or without them, but he offered to watch our clothes. It was a truly beautiful morning, but it was very early and the beach was deserted. After a fine swim we sat down among the pebbles in the watery sun to dry out, trying to look as inconspicuous as possible. But Glynn could not resist the opportunity to explore the fracture properties of the pebbles and he started to make a stone tool. Glynn was in his element, sharp flakes were flying in all directions and the tool was taking shape, but one of the flying flakes cut straight through a vein on the top of my naked foot (with hindsight thank goodness it was the foot!) and dark blue venous blood issued forth in copious quantities. I had learned in surgery that you can stop venous bleeding by elevating the affected part above the heart, so I lifted my naked leg vertically and the bleeding did soon stop. But instead of being inconspicuous the three of us immediately became very conspicuous. Mercifully two mostly naked men must have been a common sight on the Nice beach because a passing gendarme merely smiled knowingly. Meanwhile, Glynn continued to fashion the stone tool (which I still have) and whenever I notice the still-visible scar on the dorsum of my foot and I smile outwardly and inwardly and think of Glynn and especially remember the blessing of his uncomplicated and infectious enthusiasm (and the risks connected with the manufacture of stone tools).